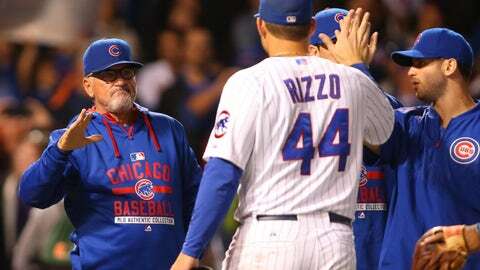 Will Joe Maddon and the Cubs add a new chapter to their history of hard luck? That’s easy for him to say, since Maddon wasn’t around for any of it. But the goat curse, the black-cat curse, the curse of Bartman and all their mutations combined can’t explain the century-and-counting World Series drought, can it? And either way, after playing some of the smartest baseball seen on either side of town in a decade, Maddon’s young team has the chance to chart a new course for the Cubs when they play the Pirates at Pittsburgh in Wednesday night’s wild-card game. Then he repeated a version of the speech in the clubhouse — ”Worry about this game only” — just before the Cubs opened their playoff series against the Dodgers. Finally, he led his players into the dugout … and nearly pulled his hair out after bumping into a priest who was sprinkling holy water up and down the team bench. The fans packing Wrigley on Oct. 6, 1945, couldn’t have known what they were getting into. The Cubs were in the middle of their last World Series appearance for, well, almost forever. 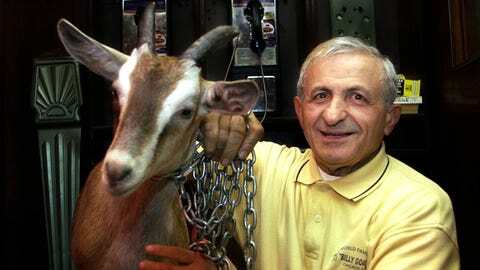 Among them was local restauranteur William Sianis and his pet goat — a stray who wandered into his bar, a serendipitous event that convinced him to rename his establishment the now-notorious ”Billy Goat Tavern” — were taking in the game from $7.20 box seats when it began to rain. Nearby fans began complaining about the odor until then-Cubs boss P.K. Wrigley took it upon himself to step in and banish both from the park. The Cubs arguably had their best team since winning three straight NL championships and back-to-back Word Series at the turn of the last century — sluggers Ernie Banks, Billy Williams and Ron Santo, pitchers Fergie Jenkins and Ken Holtzman — and were 9 1/2 games ahead of the Mets in mid-August when the tailspin began. 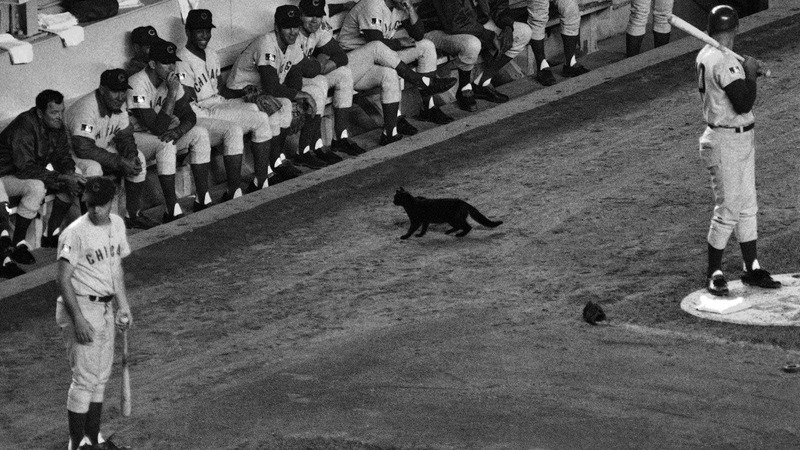 They were in New York on Sept. 9, 1969, their lead over the Mets down to 1 1/2 games when a black cat crawled out of the Shea Stadium grandstand, looped once around Santo in the on-deck circle, then stopped and stared at fiery manager Leo Durocher in the dugout for what seemed like an eternity. The Cubs hadn’t sniffed the postseason since 1945. After another horrendous start in 1983, they were buried in last place even before April was over. There were so few fans in the ballpark most days it was no problem hearing what nearly every one of them thought about manager Lee Elia’s ballplayers. After a one-run loss to the Dodgers, the most vicious taunts were still ringing in his ears. In what might have been the best postgame press conference ever, and by miles the most obscene, Elia fired back. And that was just the warm-up. Unbidden, Elia picked up steam. 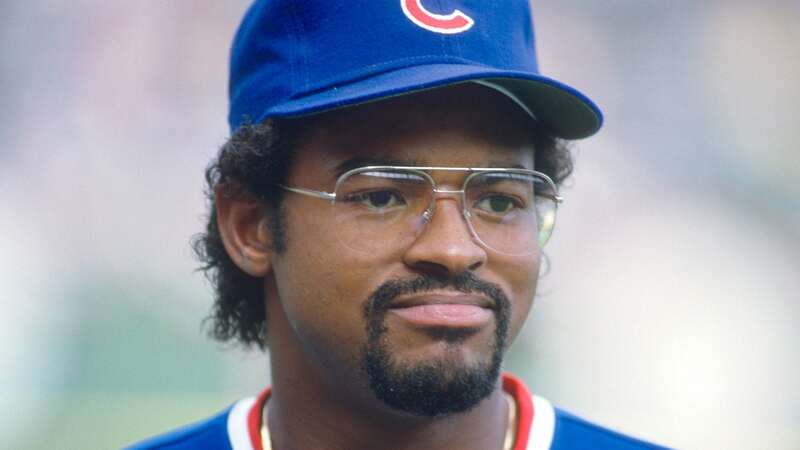 Elia somehow didn’t wind up in an unemployment line until late August, when the Cubs were 15 games under .500. He did find work again, however, managing the Phillies for a spell and serving as a special assistant with the Braves. Earlier this year Elia, now 78, went on a new rant to mark the anniversary of his legendary one. The Cubs had broken a postseason drought stretching back 39 years. They raced out to a two games to none lead over the Padres in the NL Championship Series, gave two back, but still led 3-0 early in the decisive Game 5 on Oct. 7, 1984, and even better, had Cy Young winner Rick Sutcliffe on the mound. San Diego scored twice in the sixth, and with one out and two on in the seventh, pinch-hitter Tim Flannery came to the plate. He hit a sharp grounder to first baseman Leon Durham, who hunkered down and promptly let the ball roll between his legs. A single, a double, and another single later, the Cubs trailed 6-3 and lockdown closer Goose Gossage slammed the door with a two-inning save. That moment is immortalized in a joke that still makes the rounds late at night in Wrigleyville bars. On Oct. 14, 2003, the Cubs were leading the Florida Marlins three games to two in the NLCS, ahead 3-0 in the top of the eighth inning at Wrigley and five outs from returning to the World Series for the first time since 1945. Then Florida’s Luis Castillo lifted a foul down the line in left just past the bullpen. They did, but only because a few pitches later, shortstop Alex Gonzalez made an equally ham-handed attempt on what should have been an inning-ending, double-play grounder. Florida erupted for eight runs to win Game 6 and the only real suspense left was whether the kid would get out of Wrigley Field alive that night. The Marlins clinched the NLCS that night. The last two times the Cubs made it to the playoffs, in 2007 and 2008, some twisted fans with surprisingly good butchering skills similarly tried to take matters into their own hands. They snuck up on Wrigley Field in the dead of night on the eve of the game a year apart and both times left a skinned goat hanging from a rope off the arm of the statue of famed broadcaster Harry Caray. ”I certainly hope someone didn’t kill a goat for a practical joke,” Gary Yamashiroya, commander of the Chicago police district that includes Wrigley, said after the first incident. Yet like almost everything else about being a Cubs fan since 1908, it turns out the joke is not just about them, but on them, too. The Cubs lost both division series to the Diamondbacks and Dodgers, respectively, by three games to none.